This Place of Worship was founded in 1903, and we understand it is still open. St Bernadette's Church belongs to the joint benefice of St Joseph, Shirebrook with St Bernadette, Bolsover & St Teresa, Warsop. The account of its building on St Joseph's Parish Shirebrook website tells us that a Catholic community was founded in Bolsover in 1903, when Mass was said in a wooden hut behind the house at 1 High Street. The hut was dedicated to St Joseph, and it continued to be used until 1928. In 1943, part of a derelict property at 59 High Street was adapted for a chapel, and this remained in use until 1967, when the present church was built. More information is of course available on the aforementioned website. A Building certified for worship named ST. BERNADETTE'S CATHOLIC CHURCH, High Street, Bolsover in the registration district of Chesterfield in the county of Derby, was on 20th August 1968, registered for solemnising marriages therein pursuant to section 41 of the Marriage Act, 1949, as amended by section 1(1) of the Marriage Acts Amendment Act, 1958. Dated 21st August 1968. 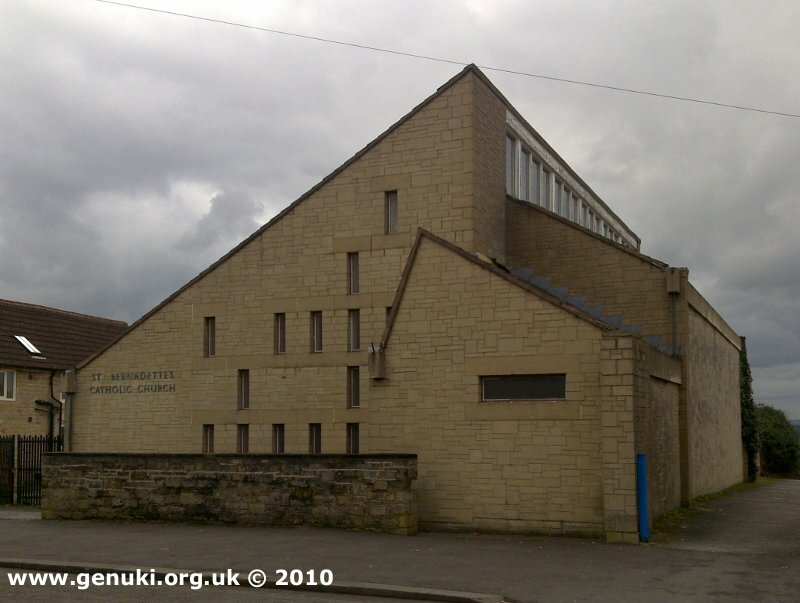 Places recorded by the Registrar General under the provisions of the Places of Worship Registration Act 1855 (2010) lists St Bernadette's Church, also a "Church of Our Lady of The Angels", both with Roman Catholic congregations, and meeting in Bolsover High Street. It seems unlikely there would be two separate churches, so it would suggest some connection between the two. Perhaps "Our Lady of The Angels" was the dedication of the 1943 building. If so, the notice of cancellation of its registration, as "Church of Our Lady of the Angels, High Street, Bolsover", took place only recently, published in the Gazette of 8th May 2014 (p.9198). St Bernadette's Church (RC), Bolsover shown on a Google Map. Places of Worship in Bolsover shown on a Google Map. I have found many websites of use whilst compiling the information for this database. Here are some which deserve mention as being of special interest for Bolsover, and perhaps to Local History and Places of Worship as a whole. You may want to visit St Joseph's Parish Shirebrook website for present-day information. Information last updated on 16 Dec 2018 at 11:53. Please also remember that whilst the above account may suggest that St Bernadette's Church (RC) remains open and accessible, this may not remain so. This Report was created 17 Apr 2019 - 01:41:02 BST from information held in the Derbyshire section of the Places of Worship Database. This was last updated on 6 Feb 2019 at 15:49.